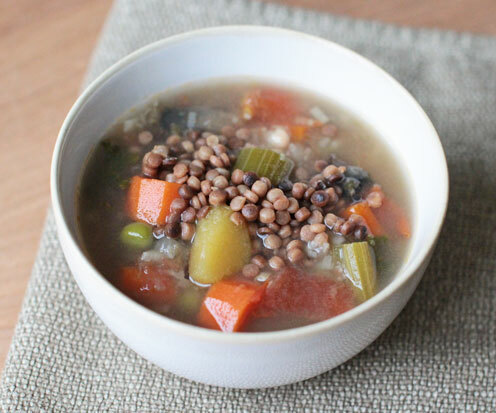 Perhaps nothing is as comforting as a hearty, healthy bowl of hot soup on a cold, grey winter day. This recipe brings you from chilled-and-tense to toasty-warm-and-relaxed through the magic of fresh vegetables. Leftovers will freeze well or store nicely for a few days in the fridge, so feel free to go big on this one, and help yourself to seconds and thirds, then save some for later. Peel and mince the shallots. 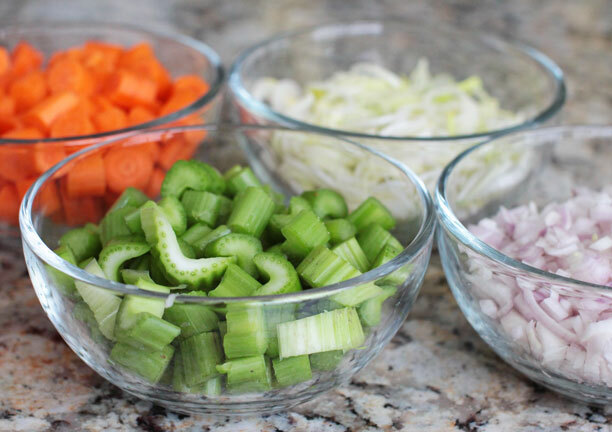 Pull off the top layer of each leek, wash them, chop off the bottom root, and slice them thinly starting from the bottom of the white part and slicing all the way up to about ¼ inch into the pale green section. Peel, wash and chop the carrots into ½-inch pieces. Wash and chop the celery ribs into ½-inch pieces. Wash, quarter and de-seed your tomatoes. De-seeding is optional, but I prefer it because I’m not super fond of tomato seeds in my soup. I do this by standing over a trash can and, plunging my thumbs into the seedy section of each quarter, scraping them out with my hands. Once the seeds are gone, then I chop the tomato flesh into smaller pieces. Slice the acorn squash in half, scoop out the seeds with a large spoon, slice it into wedges along each ridge, and then – much like you peel the skin from an apple – use a paring knife to trim away the skin from each wedge. (I’m not entirely sure that removing the skin is necessary, but I did it so the squash would be very tender.) Then chop each wedge into bite-sized pieces, about an inch-and-a-half large. Take your portobello mushrooms and, using a spoon, scrape away the gills and stem from the undersides of the caps. Using a soft brush or your hands, scrub and quickly rinse any dirt away from both sides. Wash your sprig of rosemary and run your thumbnail down the stem (against the direction of growth) to release the leaves. Mince them with a sharp knife. Wash the kale, cut away the thick stem, and chop the leaves. Now to put it all together: In a large stockpot, warm the olive oil over medium-high heat. 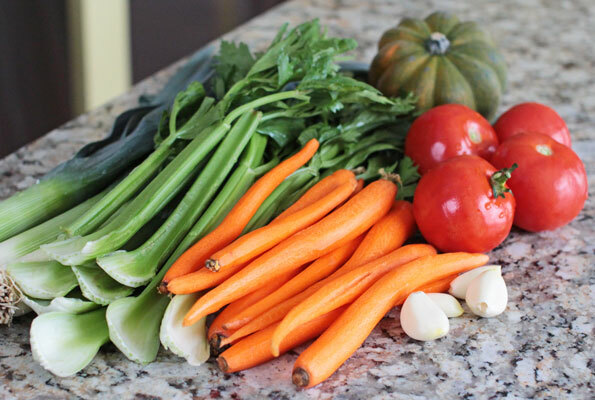 Add the shallots, leeks, carrot, celery and garlic, and stir until they begin to soften and brown slightly. Add the 10 cups of water, and bring to a boil. To the soup pot, once boiling, add the tomatoes, squash chunks and sea salt. Reduce the heat to a simmer and allow the veggies to cook until the squash begins to soften, about 8-10 minutes. Add the frozen peas, the portobello mushrooms and minced fresh rosemary. About two minutes later, add the cooked white beans. I used navy beans that I had soaked from dry and cooked the day before, but a drained, rinsed can of cannellini or navy beans, or even (why not?) red kidney beans, chickpeas or lentils, would work well, too. Once all the veggies are cooked to the desired softness, turn off the heat and drop the chopped kale leaves into the soup. Stir them around and the hot water will wilt them. They don’t necessarily need to cook much. Taste your soup and adjust the salt to taste. To serve, fill each bowl with soup, and then top with the cooked couscous, grain or pasta. I don’t recommend adding the couscous or pasta to the soup pot, as it will get soggy before long. So when storing leftovers, put the leftover couscous, grain or pasta in a separate container and add it to each re-heated bowl. There you have it. 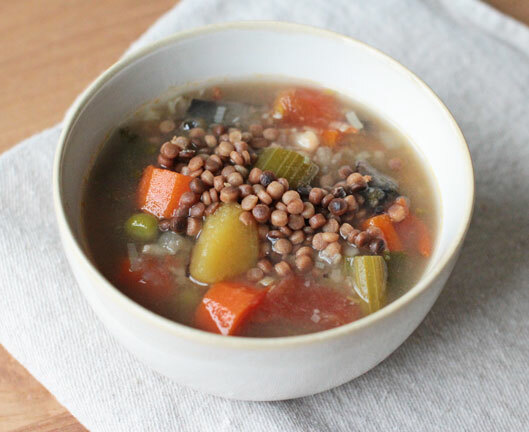 Delicious, homemade, warming, comforting, nutritious, vegan Winter Minestrone. Everyone knows that carrots are healthy. Specifically, they are an excellent source of Vitamins A, C and K, while celery is a good source of Vitamins A, K and folate. One large tomato provides about a third of the Vitamin A and C you need in a day. It also delivers a bit of Vitamin K, calcium, iron and protein. 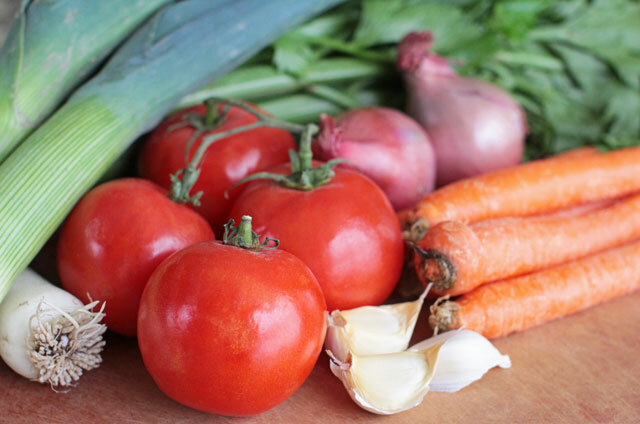 Tomatoes are also full of antioxidants – and particularly lycopene – which researchers have connected to good bone health, and they’re also known to promote heart health by lowering cholesterol and reducing the platelet aggregation that leads to atherosclerosis. 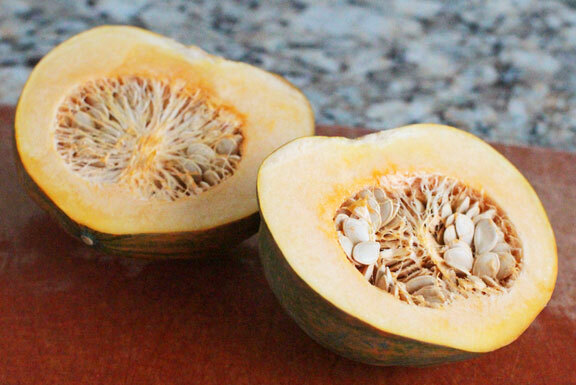 Acorn squash is a nice source of Vitamin C, as well as Vitamin A, B-6 and magnesium. Indeed, a one-cup serving provides 25% of the Vitamin C you need in a day, as well as 13% of your daily allowance of potassium. Green peas are a nutritional powerhouse. One cup of peas offers 8 grams of protein and 96% of your daily Vitamin C requirement, as well as 28% of the dietary fiber, 22% of the Vitamin A, 11% of the iron, 10% of the Vitamin B-6 and 12% of the magnesium. Bringing another plant-based protein boost to this dish, navy beans also provide Vitamins C and B-6, iron and magnesium. Vitacost sells non-GMO dried navy beans for a great price of $1.99 a pound. If you’re new to Vitacost, use this link for a $10 shopping credit. Kale is loaded with nutrition, as a good source of calcium, iron, folic acid and vitamins K, A, C and B6. As a “superfood” high in antioxidants, it is reported to be effective at preventing certain cancers, delaying the effects of ageing and reducing inflammation, as well as boosting the body’s detoxification mechanisms. Whole wheat Israeli couscous is surprisingly high in plant-based protein as well, offering 7 grams per one-third-cup serving. It’s also a good source of dietary fiber. I buy mine at my local Wegmans store, but failing that, you can pick up a bulk pack of 4 bags on Amazon.